The Short Version: Lauren Grier loves to experience other cultures through food as she travels the world, and when she returns home, she creates unique, delicious recipes to share on her popular blog Climbing Grier Mountain — which offers plenty of inspiration for a great at-home date night. You can try her interesting twists on traditional meals while you spend quiet, quality time with that special someone. But the blog isn’t all recipes, as Lauren provides context through stories of her adventures with her husband. Maybe she’ll inspire you to go on a romantic getaway, too. As someone who loves to cook while listening to music, I often find myself dancing in the kitchen with a date. I may twirl from the refrigerator to the stove and then back again, picking out ingredients and transforming them into a special meal to share. I recently invited a guy over for a home-cooked meal, and it was one of the best dates I’ve had in a while. He put on some music, and we talked as I created a fresh vegetarian dish for us. We smiled over candlelight as we enjoyed our meals. Then he did the dishes, which is how I knew there’d be another date. Lauren Grier started Climbing Grier Mountain as a way to share her creative recipes. But my comfort level in the kitchen didn’t come naturally. It took practice — and a fair amount of inspiration. Couples who want to learn how to create those memorable, mouthwatering date-night meals often turn to ClimbingGrierMountain.com for ideas. Lauren Grier, an avid world traveler with a passion for food, created the blog to share her meal creations with the world. The site is a perfect mix of twists on traditional recipes, inspiring travel stories, and plenty of fun. Lauren takes her readers along on her culinary adventures, and helps them build the skills to share her inspired meals with a special someone. 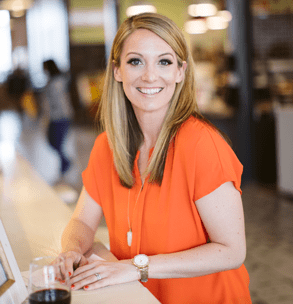 Lauren decided to start a blog in 2009 after moving from Chicago to Denver with her husband. She had recently lost her job in the financial industry when the stock market crashed, and she decided it was a good time to learn how to cook. She intended to use the new hobby to keep busy while she looked for another job. Lauren’s cooking creativity produces tasty dishes inspired by her travels. Food blogs weren’t as prevalent in 2009, and Lauren quickly built a following with her unique style of mixing in stories of her travel adventures with recipes inspired by her life in Colorado. Readers soon learned how everyday experiences inspire delicious meals in the kitchen. 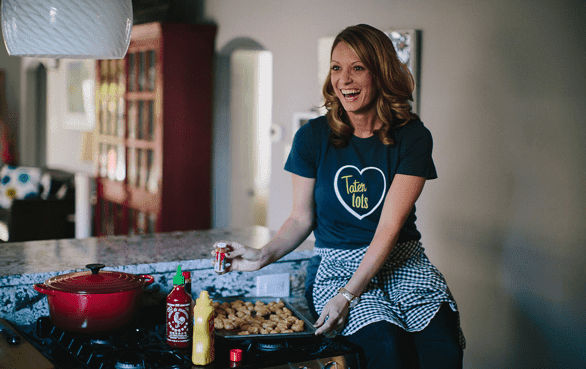 In 2016, Lauren wrote a cookbook based on her experiences called “Modern Comfort Cooking.” The success of her website and cookbook allowed Lauren to leave her job and focus on writing full time. Lauren said Climbing Grier Mountain caters to two main types of reader: the curious foodie and the person who wants to spice things up in the kitchen. In fact, almost all of her recipes have a quirky kick. For example, her popular French onion soup is baked with zucchini noodles. “It’s all about bringing traditional ingredients into more modern dishes to satisfy both chefs and homemakers,” Lauren said. The website houses a well-organized recipe index that makes it easy to find everything from breakfast and brunch to soups and stews. Just as I love to chop vegetables with my special someone, Lauren encourages all couples to spend quality time cooking together to make a connection. The key is to keep it simple. Climbing Grier Mountain shows couples how to experiment in the kitchen and connect over a meal. If you’re not sure what to make with the blood oranges, duck fat, and farro you’ve got in your refrigerator, you can search the site’s index by ingredient, as well. Gathering ingredients and cooking from scratch is much more creative and intimate than getting takeout. 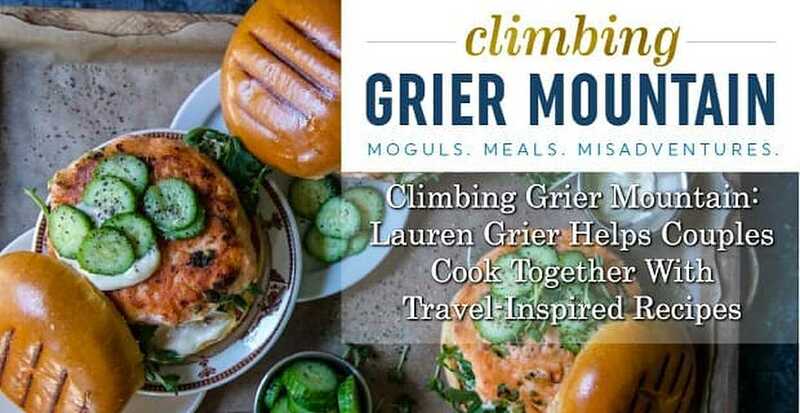 If you’re one of the many readers who turns to Climbing Grier Mountain for inspiration, you’ll want to check out Lauren’s cookbook, which is available through the website. Because, sometimes, you want to keep the mobile device or laptop out of the kitchen. “The cookbook is easy to grab recipes from while you’re moving around the kitchen,” she said. In addition to new travel-inspired recipes, Lauren ‘s working on a new spice line to honor the tastes and flavors she’s found on her adventures. She is also planning to teach culinary classes and encourages readers to take her recipes and make them their own. Of course, every time she travels, she adds a section on the blog to share any tips or recipe inspirations that come from the destination. That way, her readers can make inspired dishes from Tokyo, Petra, or even Colorado for their next date night in.